Leaving Madrid at 3pm, we’ll drive for around an hour to Segovia. A brief walking tour through the old city to admire the Roman Aqueduct, the outside of the Gothic Cathedral and a guided visit inside the Alcazar fortress, one of the most spectacular castles in Spain. until the return time. 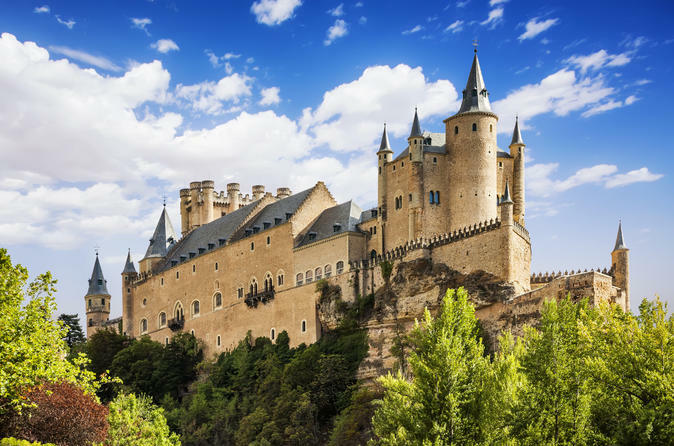 Complete the experience with a full day package including Toledo half day or El Escorial and Valley of the fallen tour in the morning. Optional luch available as well. Discover Segovia, located in Castilla & Leon region is one of the fifteen Heritage of Mankind cities in Spain. Walk through the old city and admire the Roman Aqueduct, the outside of the Gothic Cathedral and enjoy a guided visit inside the Alcazar fortress, one of the most spectacular castles in Spain. Optional El Escorial & Valley of the fallen tour starting at 9am. Located in Srerra de Guadarrama, We’ll drive for around an hour to San Lorenzo de El Escorial to see the Monastery of El Escorial built under the reign of King Philip II to be a residence for the Spanish Kings. Countinuing to The Valley of the Fallen, we'll see the monument built as a memorial of those who died during the Spanish civil war.